When you are in any form of business where you need to provide the client with an estimate, using a printable job estimate sheet will be a big help to you. Offering a free estimate to your customers does many things for them. First it allows them to see that you care enough to give them the figures upfront. Second, it allows the to see with the cost might be and that makes their saying YES to your service much easier for them. You can give customers an estimate by using our printable job estimate sheet template. 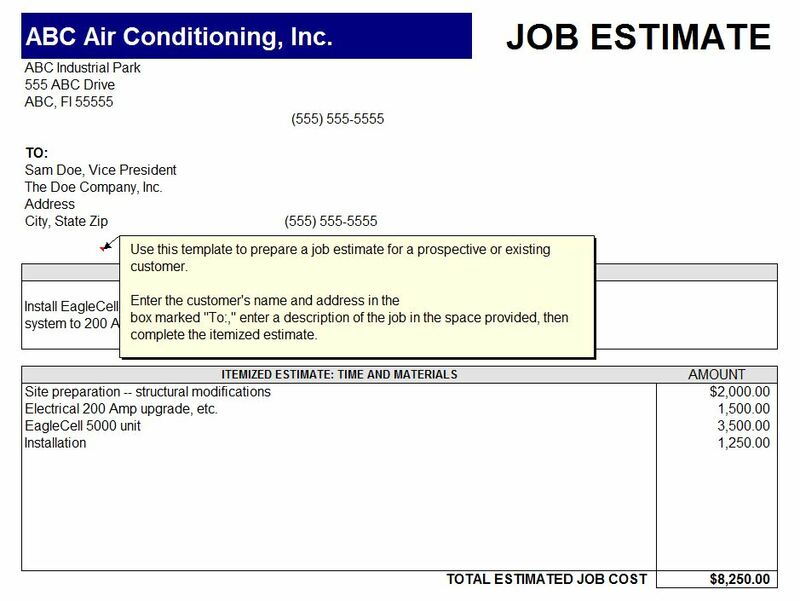 Download the printable job estimate sheet template for free here. This means that you can add important business information regarding your company. You can add a personal thank you or some tips for your clients. You can add your company motto and more. The printable job estimate sheet is easy to use and can be used for any business simply because you can customize it. Keep in mind this is just a small list of people who can use this free printable job estimate sheet. There are so many other business types that can benefit from it too. The key to using a free template like this is to make it work for your business and your customer’s needs. This template can be used for any business where an estimate is going to be required. It does not matter if that estimate is for a product or service. The template is easy to use and make your own. Because of this, it should be used to provide the customer with all of the important details of your estimate. This is a great way for people to make a choice about using your service. When they see what you are going to do for them and the amount you think it might cost, they are more able to make a wise choice to move forward with your product or service. If you own a business and need to provide estimates, you should try this free template.